The diagram shows a straight line PQ which meets a straight line RS at the point Q. The point P lies on the y-axis. (a) Write down the equation of RS in the intercept form. 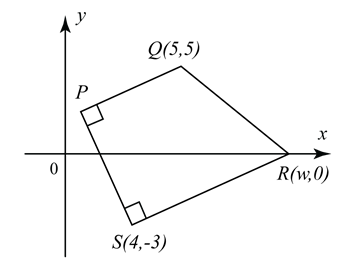 (b) Given that 2RQ = QS, find the coordinates of Q. 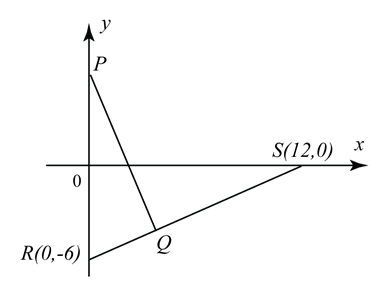 (c) Given that PQ is perpendicular to RS, find the y-intercept of PQ. (b) the equation of PS and hence find the coordinates of P.
(c) The locus of M such that triangle QMS is always perpendicular at M.
Coordinates of point P = (1, 3). x2 + y2– 9x – 2y + 5 = 0.